Do you recognise some of these thoughts? They ran through my mind for the first… well, several months, when introduced to chanting mantras. And to my own surprise, I now experience chanting as the most powerful part of my yoga practice. Every class I took at my favourite yoga studio in Amsterdam, Svaha Yoga, started and ended with chanting OM and another mantra. The first few months I hardly opened my mouth during these chants. Self conscious as I was, I thought I had two good reasons not to participate: First, the idea of a Westerner singing Indian songs with eyes closed was just weird to me. Second, I was convinced that I was a lousy singer. I came to this conclusion years ago while studying at the dance academy. Although I had always enjoyed singing, when I had to perform for an audience and was judged by my teachers, I was too insecure to sing. It made me sing out of tune. I stopped singing in front of others and concluded to myself: “I cannot sing. And well, never mind, actually I don’t like singing anyway”. I had no reason to change my mind about my singing qualities. But one day in the yoga studio, I just thought: “Ok, I’m here now anyway, let me chant along. I mean, not too loud, and I am still not a hippy, but I have nothing to lose.” My voice was just one of many, and no one cared how I sounded. I still felt self conscious and I wouldn’t want my friends or family to see me chanting mantras… but I enjoyed using my voice! It felt liberating and the sound of all our voices in unison moved me. I still thought my voice sounded badly, but I didn’t care anymore. And that was the key to opening up. A year later I started my yoga teacher training at Svaha. During the training, I would now and then teach classes at their smaller studio in Amsterdam Noord. 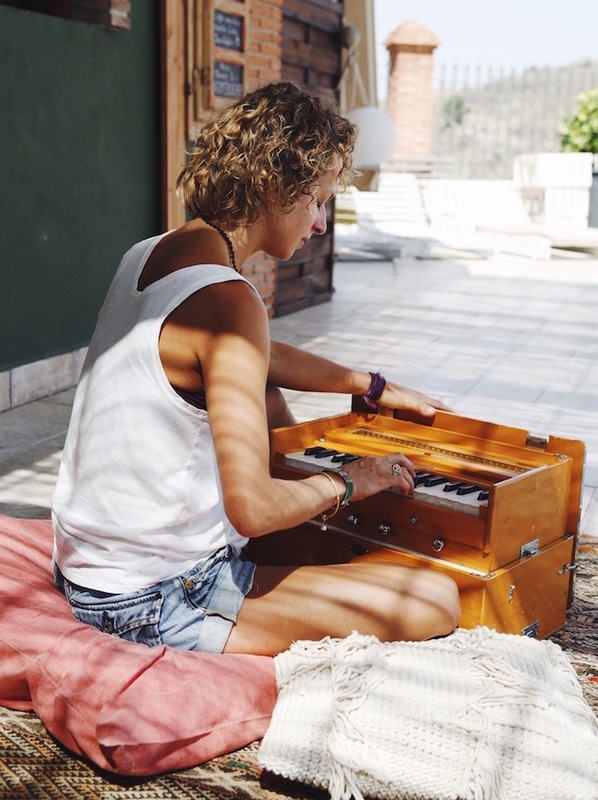 One day, moments before I taught one of my first classes, my teacher suggested I play the harmonium (type of pumped air organ, but looks like a small piano) while chanting OM. He quickly showed me the chords and how to get sound out of the instrument. By then I was used to chanting as part of a group, but to lead a mantra with my own voice and play harmonium at the same time was something else entirely. Since class was about to start and I didn’t have time to think about it, I just did it. And I loved it! From then on I would stay in the studio after class and practice melodies on the harmonium. The more I played and chanted, the more I enjoyed it. Another year later, I taught my first yoga retreats, where I led kirtan sessions (chanting together). Instead of chanting just one short mantra as part of a class, I experienced the powerful effect of chanting in a group for a longer time. Most of the guests had never chanted before, but surprisingly their reaction was really positive. I was amazed that they were open to try, remembering my own scepticism about the whole OM OM OM thing. But there we were, simply enjoying chanting together! I love chanting mantras during retreats, because there is more time to get into it. Most people have never chanted before, so I can relate to the hesitation (like “this is weeeiiird!” and “I don’t dare to sing”). I chant for the joy of chanting and I share for the joy of sharing and I think (and hope) that it helps people to open up and give it a try, and perhaps they’ll also find it to be as amazing as it is for me. And if not; they haven’t lost anything! Maybe my story inspires you to chant OM in class, listen to mantras online and sing along at home or join a kirtan session. The power of a mantra lays in the repetition and there are many melodies out there. Some are more melancholic or meditative, others can be fast and invigorating. Whichever the case, the experience of chanting (together) can be sublime. Fleur has been teaching yoga since 2011 and loves to share her passion. She is from Amsterdam and lives in Porto now. She leads Yoga Retreats all summer in Spain and Portugal. More about Fleur on her Website.